Grammy Award winner, singer, composer, acoustic guitarist and renowned Native American musician Joanne Shenandoah will perform at 7:30 p.m. Saturday, Oct. 7 at Southern Illinois University Edwardsville’s Center for Spirituality and Sustainability. SIUE’s Arts & Issues, the Center for Spirituality and Sustainability and the SIUE College of Arts and Sciences Native American Studies Program have teamed up to feature Shenandoah, who won a Grammy in 2006 for the album Sacred Ground. Shenandoah (Oneida Iroquois) has been nominated three times for a Grammy and has won more than 40 music honors for her original compositions that blend her striking voice with traditional and contemporary instrumentation to sing and chant the ancient songs of the Iroquois people. Shenandoah, PhD, is also an educator and ambassador of peace. She has done acting for television and film, and has offered healing through music since 1986. General admission is $28 for adults; $26 for SIUE staff, faculty, retirees, alumni and seniors 65 and older; and $15 for students of any school. SIUE students are admitted free, courtesy of the Office of Student Affairs. SIUE students can obtain tickets at the MUC Welcome Desk. The concert is part of a Native Studies Cultural Series to be held October 7-9, according to Greg Fields, PhD, professor in the Department of Philosophy, who was instrumental in bringing Shenandoah to campus. Award-winning journalist and author Doug George-Kanentiio (Mohawk Iroquois) will give this fall’s Native Studies lecture. Healing and Sound: A Workshop with Joanne Shenandoah (Oneida), 1 p.m. Saturday, Oct. 7 at the Center for Spirituality and Sustainability. The cost is $20 at the door. Columbus Day Observation at Cahokia Mounds, Honoring the First People of This Land, 3 p.m. Sunday, Oct. 8 at the Cahokia Mounds Interpretive Center. Representatives of the Iroquois/Six Nations-Haudenosaunee will make a presentation, led by George-Kanentiio. No charge. Aboriginal Law and Justice with award-winning journalist and author Doug George-Kanentiio (Mohawk Iroquois), 7:30 p.m. Monday, Oct. 9 at the Center for Spirituality and Sustainability. No Charge. Parking at the Center for Spirituality & Sustainability is available in adjacent Visitors Lot B, west of the Morris University Center (free on Saturdays and $1 per hour on weekdays). For more information, contact Fields at 650-2461 or email gfields@siue.edu. 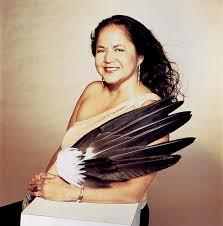 Joanne Shenandoah, critically acclaimed Native American singer, musician, educator and ambassador for peace.